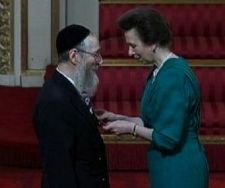 Dovid Segelman, a member of London's Chabad Lubavitch community, has been awarded with an MBE by Her Royal Highness Princess Anne. The prestigeous award was granted to Segelman for his services to the Jewish community in North London. This includes his many years of work for Chizuk, a mental health support organization for the Jewish community; Ahada, a Jewish cross-communal bereavement counselling service and involvement with Drugsline, the Ilford-based center fighting addiction. At the ceremony held in Buckingham Palace earlier this week, Princess Anne commented that it was obvious that Segelman had been adding one act of kindness after the other. Segelman was joined in the ceremony by his wife Shoshana, mother and father-in-law. In an unprecedented move, another 23 members of the Segelman family were invited into the palace grounds for official photographs. Following the ceremony, Segelman was then greeted at the palace gates by the pupils from Lubavitch Junior Girls School of Stamford Hill.